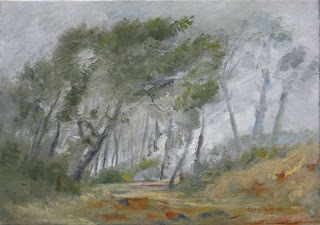 This painting was done on one of our outings to Signal Hill on a beautiful misty morning. I love atmospheric paintings. You captured the misty feeling perfectly. Wow, that response was quick Jean! Thank you! One of my favourites Carol! Your painting is so rich with mood and feeling. Awesome! Hi Carol, we all know forest paths like that, but never tried to paint one! This one, because of the wind, has a lonesome feeling that lends great atmosphere to the image! So nice Carol, you really got the feel of the mist. Thanks for the visit and kind words Kath. I really appreciate them. Sometimes I feel very out on a limb with what I produce! It is good to know that they are enjoyed. Thank you Marie. I loved the write up on you in Art Life. Beautiful paintings. I am sorry that I missed meeting you when a group of artists and friends went up the west Coast and had tea with you. Maybe next time. Thank you Barbara. When we eventually get the ADSL we have ordered, I will start visiting everyone again. At the moment dial up is just too frustrating!!! !